If you can remember buying your first RV, you’ll understand the joy (and fear) we felt when we bought our 1994 Coachmen Leprechaun Motorhome. We knew we couldn’t afford a fancy, new motorhome. And the ready-to-drive used rigs at dealerships were still a bit out of our price range. Our only choice was a pre-owned fixer-upper from Craigslist. But we knew if we bought a used camper, we’d need to do a major motorhome renovation to make the rig feel like our first home together. Newly married and ready to set out on our honeymoon, our goal was to hit all forty-eight contiguous states, film our adventure, and even write a book about our travels. We did yet know that this RV would become our home for nearly two years, or that we would love it so much that we would become full-timers. 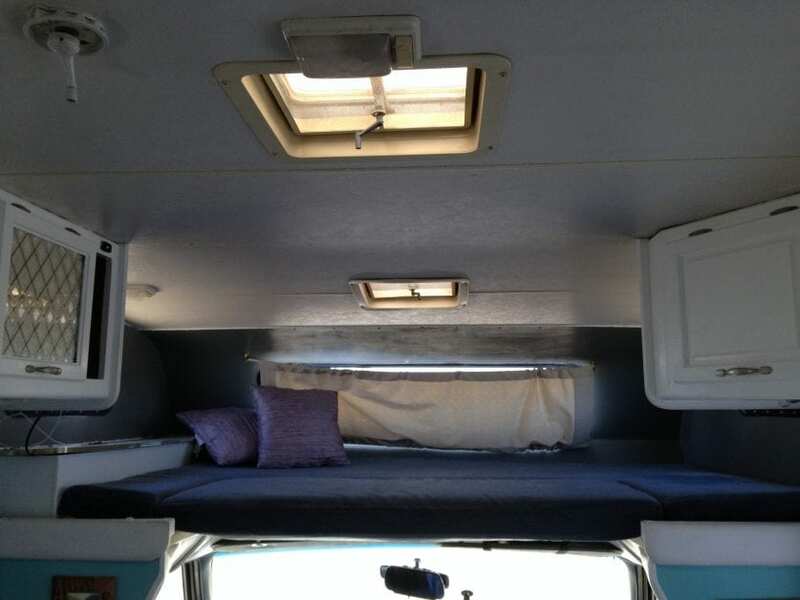 But we did know that we wanted our motorhome would be our first home together and we wanted it to be as comfortable as possible. 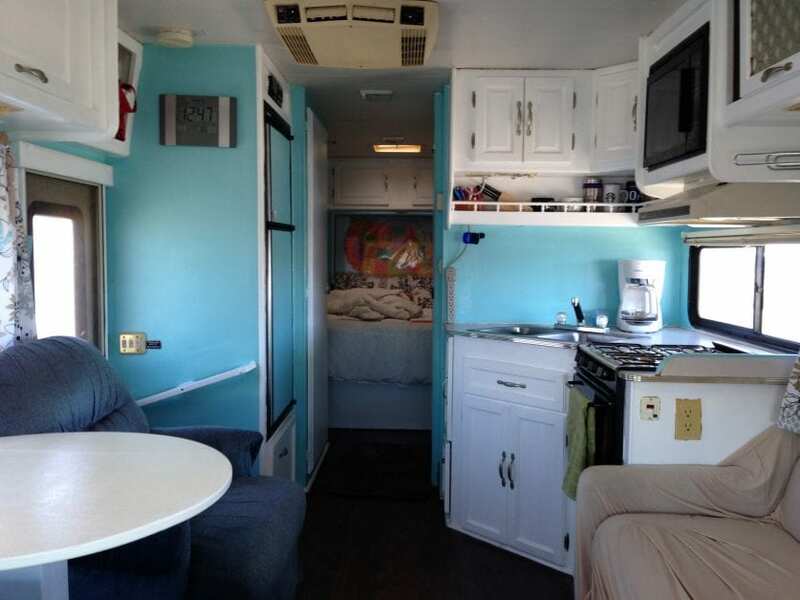 Our 20-year-old Class C would serve as a home, workspace, storage unit, and film studio. 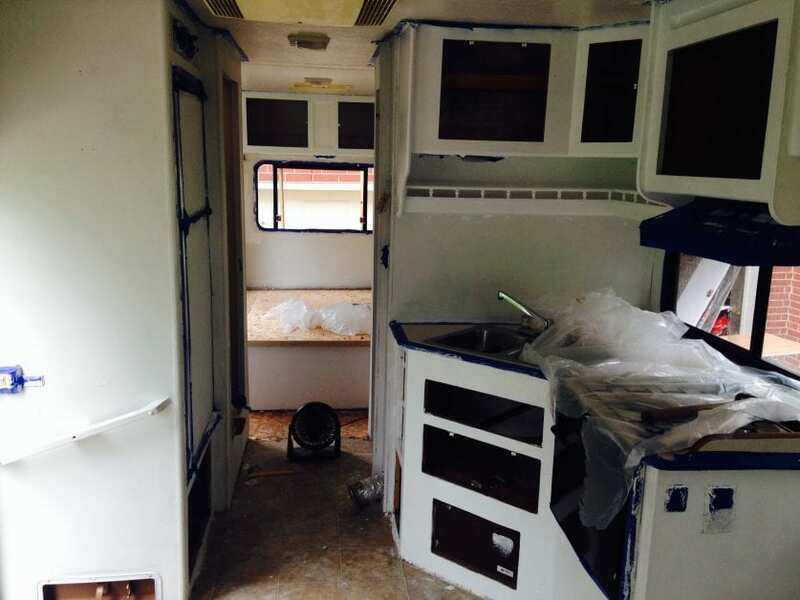 Using DoItYourselfRV.com, we scoured every article on class C motorhome renovations to spark some ideas for our remodel. 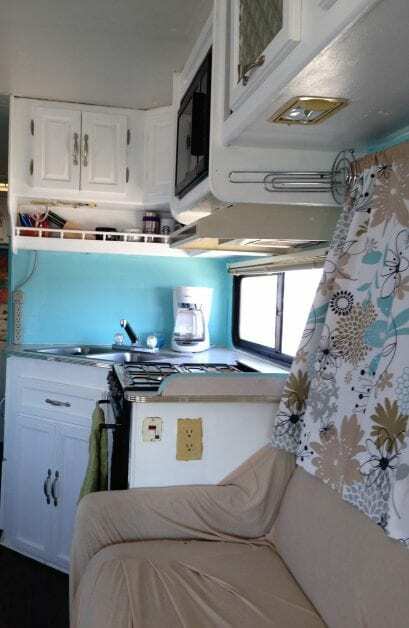 With a 29-foot rig and no slide outs, we needed to choose colors and updates to make the motor home feel more spacious and homey. We loved this Jayco redesign, so we used nearly all of their ideas – except for the lime green everywhere. That seemed like a little much to me. We wanted something a little more mellow. 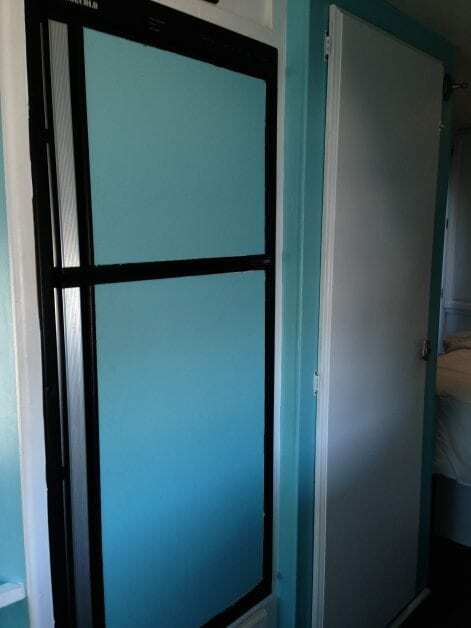 Before this remodel, Heath had never painted a wall. But was overly confident he could manage this whole remodel on his own. Re-install all removed cabinet doors, furniture, etc. We found all of our painting and flooring supplies easily at Lowe’s. All together, we spent about $500 to complete the renovation ourselves. Our other ideas included replacing all of our lights with LED bulbs and mounting a television, but then we looked at pricing and gave up on those dreams. $20 a lightbulb? No thanks. Removing all of the furniture and cabinet doors was simple enough with the right power drills, but took nearly a whole day. We primed the walls and cabinets all with the same primer, which ended up taking two full days on its own. You don’t realize how many nooks and crannies are in your RV until you take a paintbrush to them. We quickly found that the small details in the renovation are the most important. 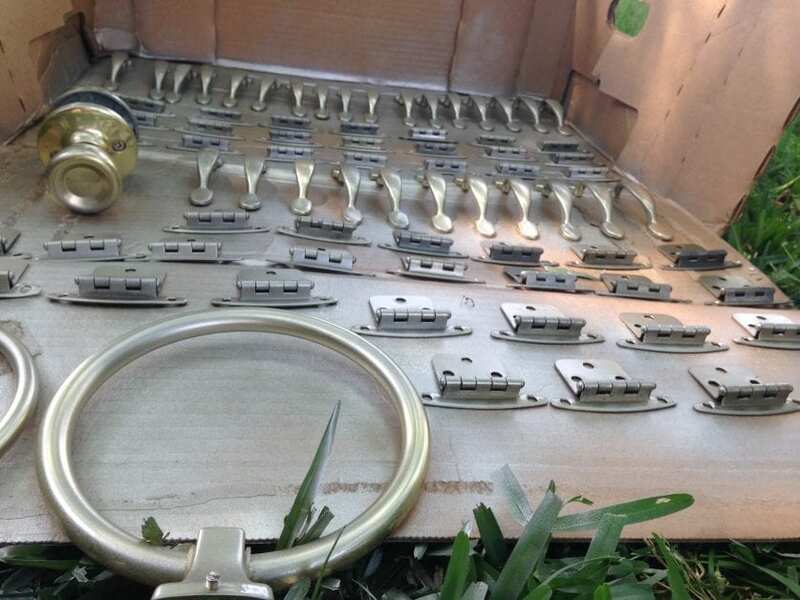 Spray-painting all of the hinges and all of the handles silver wasn’t high on our priority list until we saw what 1994 shiny gold looked like…horrible. After we finished painting all of the walls and cabinets, I needed to return to work, so I left the construction to my husband (in retrospect, obviously a bad idea). All he needed to do was paint the table, put the cabinet doors back on, and lay the new laminate floor. I’d installed laminate before, so I knew it was easy enough for him to handle. We already ripped out the carpet and planned to the lay the boards directly over the linoleum that was in our living area. While I worked, he continued to renovate. He found shower curtains that perfectly matched our walls. His mother lined and sewed them into curtains for our living area windows. She also found a tan slipcover to perfectly cover our hideous couch. For dramatic effect, my husband decided to grand reveal the finished RV to me. I didn’t mind—that meant I didn’t have to help finish the construction! When I walked in, I noticed our previously white overhead loft was suddenly a very dark shade of grey. We had argued endlessly about whether or not to paint the loft, and finally had agreed NOT to – but he painted it anyway! This is what I get for leaving Heath alone with our house. We kept our remodel simple. We were careful to pick an RV with no major system fixes. Just a little cosmetic lift and our new home felt much bigger and more comfortable than when we picked it up! Simply painting the walls and replacing the floors made a world of a difference. Our 20-year-old model, affectionately known as “Franklin the Turtle” for his speed, looks a decade younger.